As a native Minnesotan, I say with great affection that despite the beauty of the land of ten thousand lakes, visiting the state during the devastatingly freezing season of winter is probably one of the worst travel decisions a person could make. However, if I worked as an editor of karaoke videos like filmmaker Alex Karpovsky, I too would probably be enticed by any deviation from splicing together footage of uninspired, benign visuals set to the bouncing balls dancing over song lyrics which entertain tipsy bar patrons during happy hour. After failing to persuade any television networks to pick up his pitched reality series idea entitled Provincial Puzzlers that would investigate natural phenomena throughout small town America, Karpovsky hires a small crew including the cameraman whose footage and onscreen text comprises The Hole Story and flies from Boston, Massachusetts to Brainerd, Minnesota. 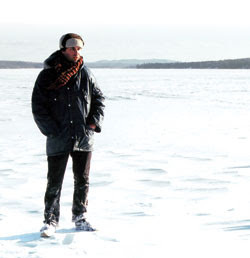 Financing the project himself, Karpovsky sets out to uncover the mystery surrounding a frozen lake with an extraordinarily large hole in the midst of the ice that refuses to freeze despite record low temperatures. Of course, once in Paul Bunyan’s old stomping ground of Brainerd, Karpovsky learns that the hole has given over to peer-pressure and conformed to the rest of the lake by freezing solid. No longer a traditional puzzler, Karpovsky doesn’t do what most of us probably would do when faced with a similar situation and head back to Boston and instead opts to wait nature out until the hole reopens. Soon enough his relationship with his girlfriend disintegrates over the phone and most of the crew (save for the aforementioned off-screen cameraman) deserts the struggling filmmaker and he begins to undergo a personal, emotional, spiritual, and existential crisis crumbling under the depressingly white on white surroundings and chilly season until he has a full-blown mental breakdown. Although essentially a mockumentary or as Karpovsky calls it in Filmmaker Magazine a “fickumentary”), the independent filmmaker who indeed worked as a karaoke video editor used his own life as a jumping off point for the film which, despite never using an actual script, has played at film festivals around the country and as Matthew Ross wrote in Filmmaker made the film which is “equal measures Woody Allen and Werner Herzog… one of the most original American comedies we’ve seen in a long time.” Filled with humor and an underlying sense of melancholy that punctuates each scene and indeed makes the film begin to go from fascinating to overly indulgent near the conclusion, it’s nonetheless a cerebral Blair Witch Project sure to interest indie film buffs and psychology majors.